Kayak Fishing: A Plastic Boat? Some ask me that question. Also: “Why do you fish out of that?” Well…let’s get into answering those questions. Kayak fishing has started to take off here in Texas, and that’s not only limited to coastal areas. With a plethora of reservoirs, lakes, creeks and bayous, chances are you have some type of water body you can access nearby. Kayak fishing has seen tremendous growth the last five years. Eric Jackson owner of Jackson kayaks, says, “Fishing kayaks are booming.” He has seen how the sport has grown. The development of more stable kayaks and high seating that aids in being able to stand up and sight cast redfish, or pitch to bass in deep cover, sure makes it easy to fish from. Who doesn’t love being that close to the action. The ability to launch from any public boat ramp or easement is a big draw for the kayak angler. Even if you do not own a truck or trailer you can “car top” your kayak. There are plenty of options for rack systems and loading assist equipment that makes them easy to transport. Plus, adding a wheeled kayak cart will have you from your vehicle to your launch quickly. The price point for getting into a solid kayak is a lot cheaper than getting into a basic boat/motor package. You can shell out the dough for a brand new kayak or spend some time cruising Facebook groups and Craigslist to find solid used kayaks. Most kayaks are outfitted with rod holders and gear tracks already installed. You can also add lots of options to rig it the way you like. Not to mention, with the addition of pedal driven kayaks, the amount of water you can cover has increased tremendously. Stealth is paramount when chasing spooky redfish. Sliding into that back lake to chase tailing reds is no problem. Accessing skinny water is a big plus for kayak fisherman. Also, sliding under bridges to access water that boats cannot can lead you to some pretty sweet spots. It sure is cool to be cruising along and drop your lure directly in front of a red fish without even making a cast. Talk about a rush! The stealth approach in a kayak is not only a benefit to inshore anglers, but also those targeting bass! Who doesn’t like having fun? That’s what kayak fishing is all about. As they say “ Even a bad day on the water is better than a good day at work.” There are plenty of kayak clubs and groups all over. The camaraderie is top notch and there are a ton of anglers out there that are willing to help a newbie get started. Let’s not forget the tournament scene. From local club trails that target bass, to redfish series with major sponsors, there are no lack of events for the competitive minded kayak angler. Most tournaments use photos of the fish caught on measuring devices called “bump boards” to determine the winners. The fish are laid on the board then photographed with an identifier code, usually written on your hand, as a way to tell apart the anglers and make sure there is no fish submitted from another time out! Let this sink in. Last year, KBF (Kayak Bass Fishing) had multiple events, both live and online, as a means to qualify for the national championship. Over 700 anglers qualified to fish the event on Kentucky Lake in Tennessee. Guess how much money first place took home? $100,000. Plus, one of our very own anglers from right here in Texas (Dwayne Taff) took the win! I have had the honor to meet and fish with Dwayne. He shared some of his thoughts with me on the growth of the sport and tournament scene. 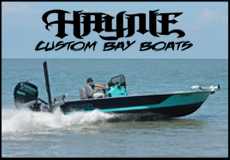 He remembers fabricating accessories himself to make things more efficient on the water and now if you can imagine it, someone has already marketed it. Businesses in the fishing industry are doing just that. The steady growth of the sport has lead many companies on board. “There are so many kayaks out there! How do I choose which one is right for me?” That is a common question, so let me help you out. It all comes down to the type of water you fish. The Jackson Coosa HD would be a great boat for moving water like creeks and streams up in the Texas hill country. If you are interested in fly fishing, then the Jackson Mayfly shines with its molded in reel pockets for rod storage and open deck concept to keep line from snagging/tangling while stripping back your fly. Are you adventurous and want the challenge of targeting some offshore species? Well then, the Jackson Kraken 13.5 would be the boat for you to push your skills beyond the breakers! What if you want a basic kayak that you can rig yourself, that is stable, lightweight, and paddles well. Then the Jackson Bite would be a great boat for you. But my best advice to you would be to go and visit your local kayak dealer and find out when the next “on the water” demo would be. That way you can paddle different kayaks and make the best decision by paddling and checking them out in person. So, are you ready to jump on the kayak fishing bandwagon? I hope so. If the ease of access and affordability don’t reel you in (pun intended), then the great people involved in this sport should. I hope to see you all on the water soon! Max Conner with a solid stringer of trout and reds. What will the effects of our icy winter have on fishing? Beginning in mid-December, the Galveston Bay Complex experienced one of its coldest winters in years. Many of the anglers have not been through a severe winter from an historical perspective. You have to go back into the 1990s to find when we had subfreezing temperatures along the Texas Coast that lasted more than a short time. Severe cold is not anything new to the Galveston Bay Complex; however, the number of days of subfreezing conditions has progressively dropped over the last decade. A frequently asked question by readers of the Galveston County Daily News is how will all of the bitter cold weather affect fishing during 2018? The answer is that it is hard to pinpoint; however, there are several indicators that tell us that when the weather warms, normal fishing patterns should return. In the good news department, it appears that there were no major fish kills during the multiple freeze events that took place. While fish kills were reported, most of the finfish were forage fish, mainly mullet, menhaden and small fish of all species that were not large enough to tolerate water in the 40 degree range very long. One of the reasons the stocks of gamefish survived well is that they had time to get acclimated to the cold and had moved into areas offering deep, protected waters. Last January, the Texas Parks and Wildlife Department exercised its right to close certain bodies of water when freeze events took place. This is the first time the TPWD has exercised that option and the areas around the Galveston Bay Complex that were affected were Moses Lake in the vicinity of the flood gates and most of Offatts Bayou. Both areas are known to hold large concentrations of trout and other fish when the water temperatures fall into the low 40s or lower. In those pockets of deep water, fish are sluggish and easy prey for anglers. Shortly after one of the freeze events in the early 1960s, I fished with a friend at the Blue Hole in Offatts Bayou and recall catching close to 50 trout (there were no size nor bag limits back then) with many of the fish being snagged by the treble hooks on my Bingo Lure. In the bad news department, the freeze took its toll on aquatic vegetation. There is little doubt that the plants will rebound; however, it could take a while after this long winter. Like with all other vegetation, warm weather is the key to rebounding and growth. The effect of the loss of aquatic plants is in the loss of cover for fish, mainly young fin fish, crustaceans and shell fish. Over the past 10 to 20 years when mild winters were the norm, we started the spring season with a good crop of bait in the marshes and wetlands. It remains to be seen just how badly the freezes affected that part of the marine life cycle. Overall, I expect 2018 to be a good year for fishing, barring any catastrophic events such as major floods or droughts. While not on the topic of fishing directly, one of the big effects of a long cold winter is on boats, especially engines and mechanical equipment. A large number of boats have not been run for many weeks and problems likely are going to be widespread, with contaminated fuel, frozen water lines and other parts that are vulnerable to freezing weather or sitting up very long. 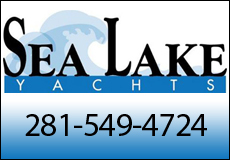 Before using your boat for the first time this year, check it out. For the first trip away from the dock, make it an abbreviated one and do not venture too far. Mike Bosse with a big trout caught on a Down South Lure in red shad. Down South Lure in Kickin’ Chicken. 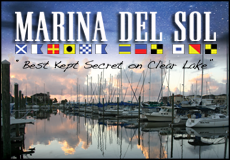 Tell me about the journey that led up to the design and success of Down South Lures. Like many people, I had an extreme love for fishing. Since I pond hopped all the time, I loved to fish for bass. This inspired me to make my first lure when I was 12 years old. I cut about 3 inches off my mom’s wooden broom handle and carved a cup out of one end to make a “popper lure.” Then I grabbed an old Heddon Torpedo, took the screw-in eyelet off the nose and screwed it into the nose of my bait. The hooks were removed from the old Torpedo, and I screwed those into the bottom of my lure. I did not paint the plug; I just tied it on and went fishing. A two-pound bass was caught that afternoon on it. Since we bass fished big lakes like Conroe, we threw a lot of Carolina rigged sickle tailed baits in deep water. We loved the way the bait swam down off the ledges when we dragged them over humps and creek beds. We were firm believers that fish ate the bait when it was falling, more often than not. Well, fast forward about 15 years and I found a love for saltwater fishing. I noticed that most of the paddle tails and tout tails did not swim on the fall like our bass worms did. After that, I began to tinker with other plastic baits, modifying them to have action while falling. It just grew from there. More and more friends were asking me to make them baits. After that I cut my own mold design. It has grown into the Down South Lure that you see today. Were there any unforeseen challenges or surprises have you encountered while developing Down South? One of the biggest challenges in the lure industry is that you have to prove that your bait is different and has a place in peoples’ tackle boxes. The only way you can do that is by fishing with it, and getting it into the hands of reputable fishermen. Once they see that the bait has merit, they will begin to purchase your lure. It’s very hard to get fisherman to switch from something they have been throwing successfully for years. Another surprise to me was that it was extremely hard to get shelf space. Going into it, I figured that if I had a good product with professional packaging, I would be granted pegs. That’s not the case at all. People have to ask for your products over and over. Then you can get a spot on the wall in a tackle shop. Michael Naymik with a 23.3″ Galveston flounder caught on Down South Lures. What is your personal favorite DSL lure/rigging? I’m pretty simple. I like a 1/4 oz. or 1/8 oz. 3/0 jighead rigged with either the original Southern Shad or the Super Model XL. I throw various colors, depending on the water clarity. If I had to pick one color for all clarity it would be Chicken of the C.
What colors and riggings are best for the super DSL for big trout in the winter? I like to go with as light a jighead as possible considering the conditions. If it is windy, or the current is moving pretty good you may have to use a little heavier jighead. If you notice that your lure is not getting down to the bottom, and there is a big bow in your slack line, you need to go heavier. My personal favorite “big fish” colors are Red Shad, True Plum, Key Lime, and Howell’s Strawberry Wine. What kind of retrieve do you recommend when fishing DSLs? Retrieves can vary with the conditions as well. My personal all-around favorite is to let the bait sink to the bottom and then retrieve with a twitch, twitch, pause cadence. I think fish are more reactionary feeders, and that they do not over think when feeding. That’s how they have survived this long. The twitch, twitch, pause resembles a classic “two hop” shrimp escape. Though my bait more resembles a fish swimming, or an eel escaping to the bottom, I always think that the most natural movements get the most strikes. You will notice that most of your bites will be when this bait is falling. Do you have a favorite fishing moment? Could be a big fish or trophy but also a special fish or situation. We got up early, and I told her I was not going to fish, just run the trolling motor. We eased up to the point and she caught 3 fish very quickly to 4 pounds on a pink MirrOlure She Dog (She loves topwater and the conditions were perfect for it.) As we approached to honey hole, I told her to cast right by that one larger rock that had a wash out behind it. She gave it a perfect cast, and within 6 twitches she had a major explosion. It ended up being her largest trout ever measuring 28.5 inches. She said, let’s quit on that cast, but I wanted a flounder for lunch. We agreed to try for 15 minutes pitching around some rocks in a spot where I have caught them before. It was only 50 yards away from the trout spot. Within 5 minutes I had the solid thump of a flounder right by the boat on my Chicken of the C lure. I set the hook, and all hell broke loose. It was a big red! I told my girlfriend to get the net because I saw how many spots it had on its side. It was absolutely covered. I told her whatever you do, do not miss this fish! I’ll never hook one like this again. She got it on the first swipe. It measured 31.5 inches and had 144 spots on it. I took close up photos of both sides of the fish, and released the beauty for someone else to catch. We never made another cast that morning. I racked the trolling motor up and we headed back to the dock. The moral of the story is, I’ve had better days with numbers of fish, but we both broke personal records that day. 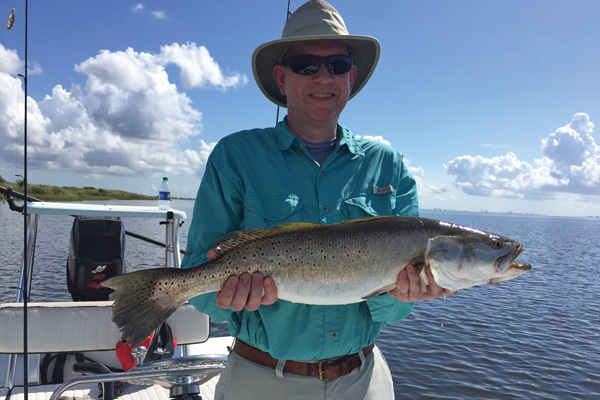 This big trout was caught on a Key Lime Super Model in Mansfield with Capt. Daniel Land. What’s your favorite place you have fished? If I had to pick one bay system in Texas, it would be Port Mansfield. The vast grass flats are just too appealing. The deep reefs and rocks of Galveston are a close second in the state. Poling for permit in the Florida Keys is my favorite out of state adventure. Aside from fishing, what else are you passionate about? When I’m not fishing, I like to hang out with friends, watch football, and BBQ while enjoying a cold beverage. We enjoy going deer hunting when we get a chance as well. Recently, I have become more intrigued with deer hunting, so my tournament partner and I have secured a deer lease in south Texas for next year. 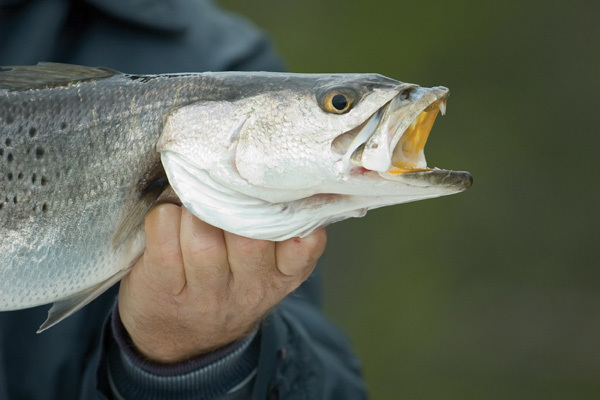 Is there any Down South Lure news or upcoming events you’d like to let our readers know about? Yes, always be on the lookout for new and innovating products and colors that we are working on releasing. Give us a follow on Facebook and Instagram to see all the updates. We post everything up there, and feature exceptional catches on our page. 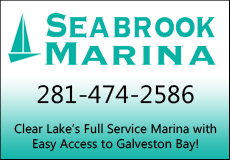 As always, we will have a booth at the Houston Boat Show in January, The All Valley Boat Show in McAllen in February, and The Houston Fishing Show in March. We always have our lures and apparel on special at these shows, so come by and get a deal. In addition, we will be doing some raffles and drawings for people that stop by at these shows. As always, you can shop all of our products at www.downsouthlures.com. See you guys soon and tight lines. The flounder run is coming! Years ago by November, fall fishing patterns would be well under way and the annual flounder and golden croaker migrations in full swing. This is not the case now and anglers have moved the time table ahead as a result. While growing up around the Galveston Bay Complex, saltwater anglers looked to Columbus Day in early October as the time when they could count on the onset of fall fishing patterns. For a number of years now, fall weather patterns have not set in until much later, usually close to November. Fall fishing patterns are triggered by the water temperature in the bays and it is not until the readings fall below 70 degrees that we can count on much in the way of autumn fishing. Sunlight or presenting it a different way, shorter periods of daylight, also influence fish to move into their fall feeding style. Fortunately, while weather patterns may change, periods of daylight do not, so that is one constant we can count on in the equation. 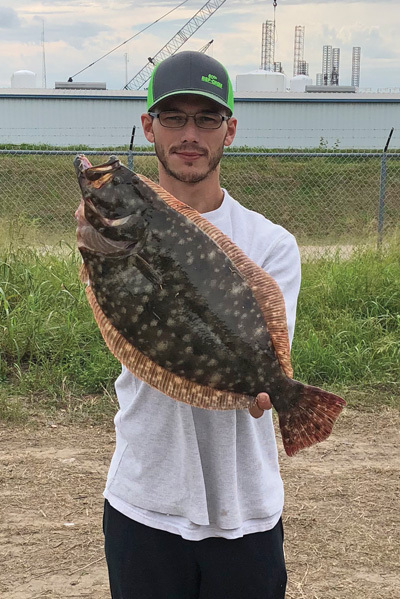 An example of how our weather pattern has changed comes with the special flounder regulations that were set by the Texas Parks and Wildlife Department to protect flounder from over harvesting during their fall migration or as anglers call it the Fall Flounder Run. The dates for the special regulations that cut the bag limit to two per day and outlawed flounder gigging were Nov. 1 through 30. Those dates were chosen because historically the flounder run was in its peak during November and by December 1, nearly over. Quickly TPWD observed that the flounder migration lasted well into December and amended the rules to add the first two weeks of that month. Mentioned earlier was the fact that Columbus Day was looked to as the kick-off of the fall fishing season and now that has changed. If I were to choose a holiday that better represents the time when fall fishing is in full swing, it would be Veteran’s Day on Nov. 11. Now, with that background, what is the outlook for this year’s fall fishing? Let’s take a look at speckled trout first. 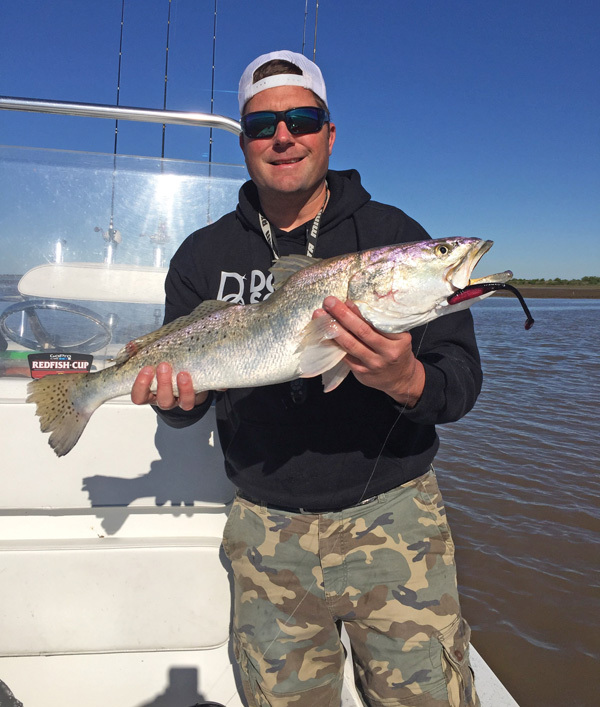 The record floods of late August and early September likely will continue to affect speckled trout fishing through at least the early part of November. Trinity Bay and the upper reaches of Galveston Bay continue to have enormous amounts of fresh water pouring into them. Until that stops and salinity levels improve, don’t look for the prolific fall trout action for which those areas are famous. On the other hand, East and West Bays should be hot spots once the water temperature cooperates. Hordes of specks migrated out of the lower salinity areas to locations closer to the Gulf of Mexico and likely will remain until the “All Clear” signal is given to migrate north. 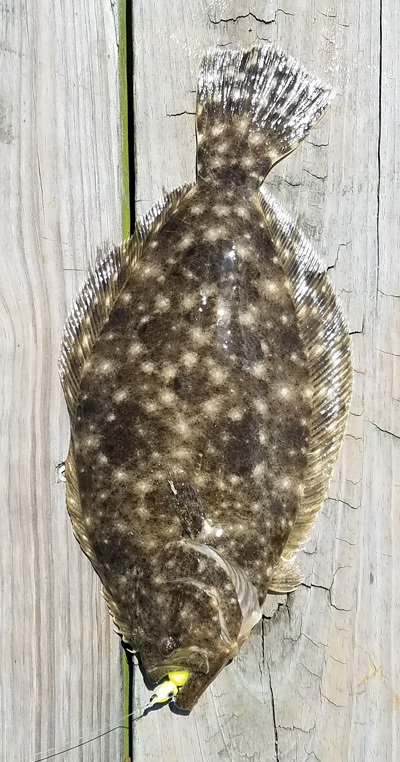 The fall flounder run is shaping up to be a good one this year, as a good crop of quality flat fish is in the bays and, once a few genuine cold fronts pass through, look for the passes to the Gulf to be wall to wall with both flounder and fishermen. Redfish action has been outstanding all during this fall season. Reds of all sizes have been caught in good numbers in the lower bays and surf. Look for that to continue, as reds are not nearly as sensitive to salinity levels as other fish. Once the water cools, look for the back bays and marshes to turn on. The annual golden croaker run, which usually occurs about the time of the flounder run, has been a big disappointment in recent years. During November large golden croaker known as bull croaker make their run to the Gulf of Mexico for spawning and are easy prey for anglers fishing near the passes into the Gulf. While there has been some good action during the run, it has not measured up to that of 20 years ago and beyond. In summary, it is going to take a couple of things to really trigger some hot fall fishing and those are getting the water temperature down into the 60s and eliminating the heavy flows of fresh water into the bays. Once the water temperature drops look out! The action will be hot and heavy. Lots of questions are being asked about the effects of the recent flood waters on the Galveston Bay Complex. Most of the questions are centered on whether the floods have a beneficial or detrimental impact on the eco-system and what we can expect in the way of fishing this fall. For a number of years, the Galveston Bay Complex was experiencing a serious drought that was beginning to change the ecology of the bay. High levels of salinity and restricted flows of fresh water from rivers and creeks were taking its toll on the wetlands and back bays. Concerns were mounting about a change in our fish patterns, in particular a possible migration of certain species of fish out of the bays and an influx of different species into the bays. It certainly was a situation that warranted concern. Three years ago, the first of a series of heavy flooding hit and eventually lowered the salinity levels and created some ideal conditions for growing our stocks of marine life, both fin fish and shell fish. In most cases, flood waters entering the bays do a lot of good for the basic component of the marine life cycle and that is the estuaries. The nutrients that are washed into the rivers and other outlets help the vegetation grow and in turn provide a sanctuary for newly hatched marine life. This is obviously a real benefit to all who partake in saltwater recreational activities and most beneficial to anglers in all areas including those who fish offshore. On the other hand, flood waters that contain heavy concentrations of contaminants can be detrimental to the estuaries. Contaminants in the form of chemicals and metals are the most destructive, as they can and do kill the life line of the estuaries, the vegetation and in general pollute the waters. Just how our recent flood affects the sensitive balance in the wetlands is yet to be determined. While it remains to be seen as to the effects on the estuaries, there are a few things that can pretty well be counted on as far as the effects on fishing and crabbing. Following the floods and during the time when heavy flows of water continued to pour into the bays, we have experienced a welcomed dry spell with northerly and westerly winds dominating under low humidity. This has helped to get the flood waters draining more rapidly. Most of Galveston Bay has been muddy and off color with little or no salinity. How long this will last is anyone’s guess. 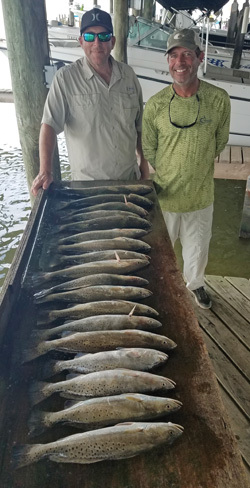 Most of the time, trout will move out of the upper reaches of the bay system and settle in areas that are closer to the Gulf of Mexico such as those around the passes and jetties. In those areas, trout tend to stack up and become easy prey for anglers. Using last year as an example, our heavy floods came early in the summer and were followed by a similar pattern of hot, dry weather. It was at least two months before the bays started showing signs of improvement. If that pattern repeats itself, it could be November before the water returns to normal around the Galveston Bay Complex. This is especially true in light of the fact that this year’s flooding was more extensive and severe than in years past. So what does that mean for fishing? 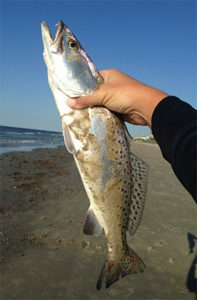 Well, for speckled trout especially they are going to be found in large concentrations closer to the coast. 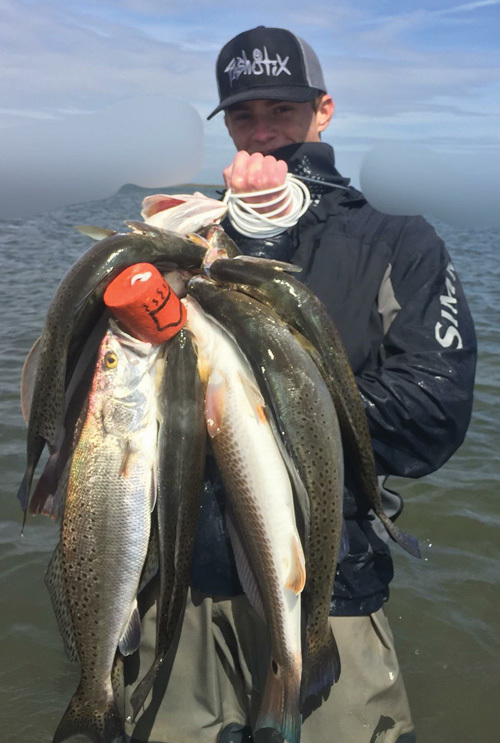 The jetties, surf and lower Galveston Bay should hold the prized game fish for quite a while. Reds and other fish likely will be the offering in the upper reaches of the bay system, as they are not nearly as sensitive to salinity as are trout. 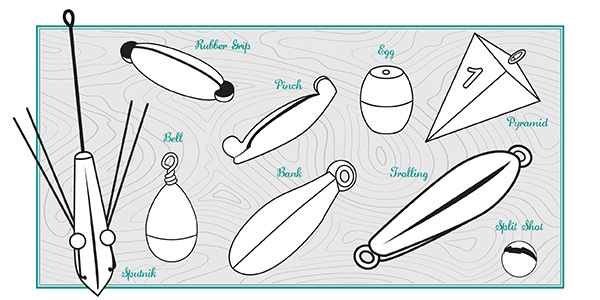 The different types of fishing weights. While writing the fishing report each day for the Galveston Daily News, there are many questions that readers ask about fishing and fishing equipment. One question that crops up fairly often has to do with fishing weights. The inquiries are generated by anglers who shop at tackle stores or bait shops and see a wide variety of weights on the shelves and are curious as to how to distinguish between the choices. Another common question about weights has to do with a recommendation of what weight or weights should be used for a particular type of fishing. Hopefully this article will shed some light on those questions and provide some useful information about how and when to use the various weights. Browsing around the fishing weight displays in tackle shops can be a confusing adventure, as most of the larger operations have dozens of different types on display with only a few being popular with fishermen. Before getting into the various weights available, let’s address a basic question. For what type of fishing is the weight designed? 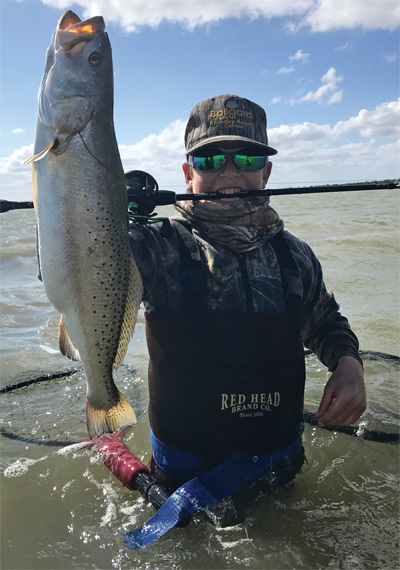 Casting for trout and reds involves different types of weights than say surf fishing or offshore fishing in the Gulf of Mexico. Pier fishing also has its unique type of weights. For most types of fishing, the objective is to get your bait down with the least amount of weight. Currents, wave action and wind all effect the choice of weights. When viewing the choices of weights at most tackle stores there are several that stand out and for purposes of this article we will focus on the most popular along the upper Texas coast. 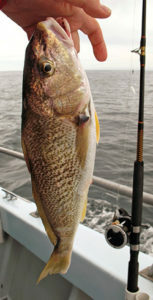 Photo of Atlantic Croaker caught on a headboat off the coast of Ocean City Maryland. For bank and pier fishermen who cast baits with a double drop leader and weight at the bottom, the most popular are the bank sinker, pyramid and bell weights. All come in varied sizes and are designed to get the rig (leader, hooks and weight) to the bottom quickly before the “trash fish” attack on the way down is successful. This type of fishing is great for pan fish and is the most convenient and popular style when fishing from piers, rock groins and jetties with dead bait. Live shrimp is a top choice for speckled trout. When using live bait, other weights are the answer and again the objective is to get your bait out there and to a depth where the fish are feeding. This is much more challenging than just getting your baits to the bottom. Current strength is the key to choosing the right weight and just as important, the type of weight. When fishing for most game fish, whether from a pier, wading or a boat, a slip weight is the best choice. Slip weights include egg weights and the easily changeable rubber grip weights and pinch weights. All are found in various sizes and again the choice is determined by where you want your bait in relation to the current flow. Another of the detachable weights is the split shot which is easily attached and removed from fishing lines and is one of the smaller weights. This weight is popular with anglers free-lining bait with little resistance. One weight that gets more attention or curiosity than most is the odd looking surf fishing bait called the Sputnik. The name comes from its resembling a satellite with antennas. This bait is popular with surf fishermen as it digs into the sand and is not nearly as affected by wave action and tidal flow as other weights. It also is popular with anglers fishing rocky or debris filled areas, as the wire protrusions we call antennas are much more easily removed from being stuck in the rocks or debris. Finally, we deal with offshore weights. While heavy pyramid, bank and egg weights are popular for getting baits down to the reef fish, the trolling weights have been found to move the rigs faster to the bottom. The reason is their slim design that does not displace as much water as other bottom weights. While there is a desirable and proper weight out there for whatever your choice of fishing, remember the key to all of this is to get your bait to its desired location with the least amount of resistance. Tom Lightfoot with a fat trout caught on a Slammin’ Chicken Bass Assassin Sea Shad. 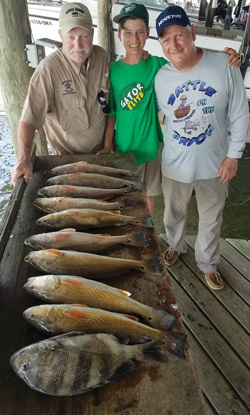 September probably isn’t the first month that comes to mind for most people when it comes to great Galveston redfish and trout fishing on the upper Texas Coast. Most of us have other things on our minds, like avoiding the heat, or getting back in the swing of things with the kids back to school. Given these distractions, fishing doesn’t usually come first. Yes, the heat can still be oppressive in September, but unbeknown to many, the fishing can be every bit as hot. Most years just surviving July and August is enough to slow down the average angler around the bay, with high temperatures and light winds. These dog days of summer can be very tough, if you’re a drift fisher; there is not much to move the boat, or if you pole a boat in shallow water it’s just downright hot. If you like to wade fish, you might find an advantage of at least being a little cooler. The hot and dry temperatures of July and August can truly make anglers work for their catch. There are some definite differences in where the redfish and trout will be when we hit drought conditions. It’s quite frequent that the fish will move from open bay shorelines, where salinities sky rocket, to marshes, creeks and rivers where salt levels in the water are more comfortable and food is more abundant. The extreme hot and dry conditions common in July and August help set up the subtle changes that September brings. Even though we may see some high temperature days, there are some notable differences that seem to bring fish back to open water flats and create even better conditions for fish to feed consistently. September tends to be a month when we see a good bit more Gulf moisture coming onshore. This rain helps a great deal in not only bringing down the salt levels across the bay, but also by cooling the water several degrees during the peak heating hours of the day. These late summer rains do a great job of lowering salinity without the harm of runoff, which carries dirty water to the bay that is often contaminated with everything from our streets, lawns and anything else that is upstream. This also differs greatly from spring rains where we often see huge amounts of river and creek run off which can have an adverse effect on the bay. The major difference with summer rains is that they fall directly on the bay, causing an immediate temperature and salinity drop that seems to excite shrimp and small baitfish activity and in turn, accelerates predator feeding. So, we’ve managed to cool off the bay temperatures during the highest heat of the year, we’ve also lowered the salinity, just after peak salinities. Those two changes alone would help kick up feeding activity a good bit. We also see the peak of baitfish and crustacean growth and activity. 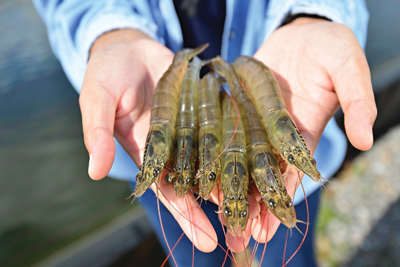 Shrimp crops have grown, crabs come out of the marsh, numerous small species of fish are reaching sizes where they migrate out into open water and this all adds up to some great fishing. 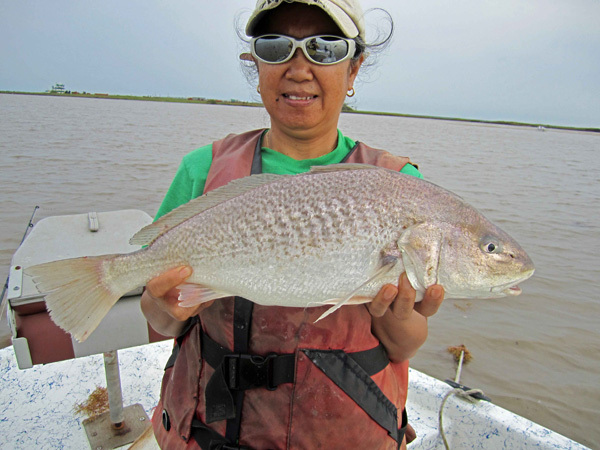 Brenda Lightfoot with a marsh redfish caught on a weedless gold spoon. There aren’t many techniques that aren’t effective in September, whether you choose to fish with live bait, artificial, or even fly, the bays are alive both shallow and deep. I don’t really spend much time out in open or deep water, but the change in the shallows is nothing short of exceptional. 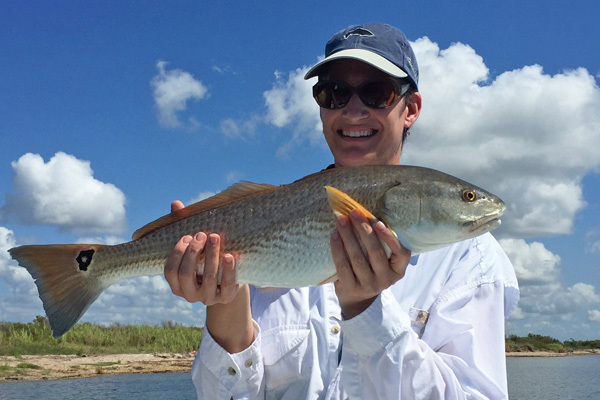 Early September is almost always a great month for finding tailing redfish, not just single fish, but schools that are often bigger than other months of the year. September is also one of the peak months for me to find larger trout in shallow water. My approach changes little throughout the year, but for those who aren’t as familiar with shallow water, take your time in your search. Don’t run your boat directly up onto the area that you intend to fish. Come off plane early and use a troll motor, push pole or wade into the area. When looking for signs of activity, shore birds are a great sign, with active mullet being equally important. Often times these fish will slick, and redfish will stir up mud. When you get into the area you want to fish, continue to take your time and cover the water thoroughly. There are a lot of days when schools of feeding fish just don’t make a big commotion. If you’re looking for tailing reds, keep in mind that they don’t usually make much noise and the surface disturbance is minimal. One last thought, having a shallow water boat is a great thing and opens up lots of new territory that isn’t available to many people. Keep in mind that fish are shallow for several reasons; availability of food sources, protection from larger predators and possibly at the top of the list is shelter from the noise and danger of all the boats that run in open water. So, if you choose to operate your boat in shallow water at speed when looking for fish, remember that even though you may gain some short term satisfaction, in the long run you are doing more harm than good to both the fish and the habitat. Fish tend to operate mostly on instinct, but they do get conditioned to their environment and repeatedly getting run off of their shallow feeding grounds only moves them to areas that afford greater safety. Earlier this year, the Texas Parks and Wildlife Department conducted scoping hearings around the state to present their ideas on long-term management of our fish stocks and to receive input from sportsmen on their views about changes in size and bag limits for certain fish. While the stocks of our big three, flounder, reds and trout, currently are in good shape, biologists feel that long range planning needs to start in order to assure adequate stocks of that resource for future generations. Of particular concern to the biologists is the forecasted future of the Galveston Bay Complex and the potential changes that lie ahead for that body of water. The cause of the immediate concern is the reduction in quantity and quality of fresh water forecasted for Galveston Bay. With rising populations along the feeder rivers, water consumption will continue to increase thus reducing the amount flowing into the wetlands and bay itself. Of equal concern are the multiple treatments the water goes through before it reaches the coast. Each treatment process adds chemicals to the water and filters out nutrients. One of the detriments to the reduced flow of water will be an increase in salinity levels through-out the complex. This will have an adverse effect on the wetlands. Approximately 98% of all finfish and shellfish are dependent upon the wetlands either as part of their life cycle or as part of their food chain. This does not take into account the role of wetlands as part of the life cycles of waterfowl and other forms of life. The marshes, swamps and other forms of wetlands offer a filtering effect for water and, through the filtering process, collect microscopic marine life that feeds the next layer in the food chain. The wetlands also are a buffer when hurricanes hit the coast and absorb part of the brunt of the storm before it reaches higher land. Last, but not least, the wetlands offer recreational aspects for fishermen, hunters and nature lovers, including bird watchers. An increase in salinity along with less water will further reduce the ever shrinking acreage along the upper Texas Coast. So, what do biologists foresee will happen? During a visit with Lance Robinson and other personnel connected with the TPWD’s Dickinson Marine Lab we touched upon this topic. First, Galveston Bay, unlike fresh water reservoirs, will retain its water levels due to tidal ebb and flow from the Gulf. The difference is going to be in higher salinity levels and less wetlands. So, how will this affect our fish? It is foreseen that different species will begin appearing, much like the presence of mangrove snapper in the bays over the last three years. Mangroves are warm water fish and one of the first to be affected by cold weather. During the 2012 light freeze along the coast mangroves or gray snapper as they also are called were the primary fish, besides bait fish, that were found floating after the cold spell. No significant kills of game fish occurred although speckled trout are close behind mangroves in their lack of cold water tolerance. 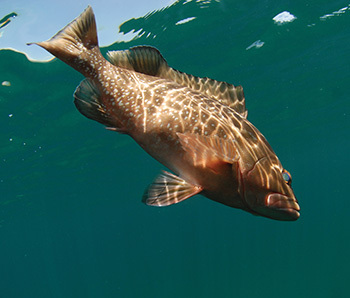 Beside mangroves, the higher than normal water temperatures attracted offshore fish such as gag grouper that were rarely seen in the bays in earlier years. Another factor with potential fish changing effects is the proposed deepening of the Houston Ship Channel up to Pelican Island. The deeper channel from the Gulf of Mexico likely will bring in more species that are typically found offshore and add to the flow of Gulf waters into the bay. So, what can we expect in the future? Change is about all that can be counted upon at this stage. Some fish will adapt while other will not and the survivors migrate to other areas. All of this leads up to support of conservation efforts to protect our current stocks. Catch and release along with limited retention of fish is a practice all anglers are going to have to employ if we are interested in our future generations enjoying this sport.